Beijing is my birth place and my childhood. It's also one of the biggest political centers of the world. I ran away from Beijing as soon as I could, and for many years I thought I'd never go back if I could help it. Maybe my age is getting to me, maybe years gone by had softened our feelings, good and bad. Like they say, time and distance are the best cure. Ultimately I have to prove to myself and the world that I'm still Chinese and can still live as a Chinese person. In December I spent almost three weeks in Beijing and did just that, living as a Chinese person. I ate Chinese everywhere I went, spoke only Chinese except with my American friends, rode public transit enough to become more knowledgeable than some locals! The purpose of the trip was to attend a memorial ceremony for my maternal grandmother, for her 100th year birthday celebration. I saw my aunts and uncles for the first time since I was a girl, and saw many of my cousins for the very first time. I saw my father in many years and met his "new" wife, who has been with him longer than my parents were together. Family, it's complicated. I wrote about my grandmother a few years ago here, for your leisure reading. The red book in the picture is a collection of pictures and articles my aunts and uncles put together for the event. It's so great to see my grandmother officially memorialized by her own family. What's a trip without some yarn shopping! 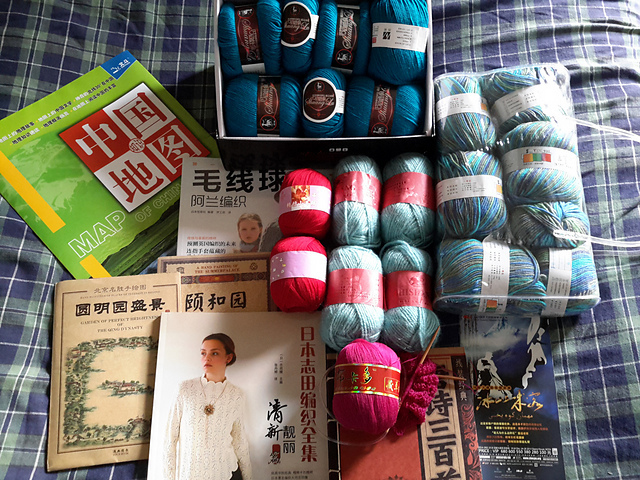 I got in touch with the Beijing knitters early in my planning and Dawn ended up to be my personal tour guide to the yarn market. This is only portion of the yarn and books I brought home. I wish we could be there at the same time one day, what fun that would be!